The evidence for saw palmetto is less impressive and recent studies have failed to show any benefit over placebo. It may help to shrink the inner lining of the prostate, but does not decrease its overall size. A typical dose is 320 mg per day of extract standardized to 85% to 95% fatty acids) (see Saw Palmetto -- What to Consider When Buying). 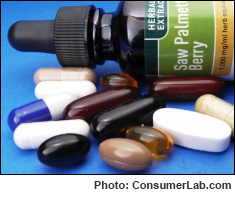 ConsumerLab.com's tests identified a number of saw palmetto and beta-sitosterol supplements which contained the generally recommended amounts of these ingredients. However, one saw palmetto product was found to contain fewer fatty acids than expected, and two saw palmetto/beta-sitosterol combination products were found to be improperly labeled (See What CL Found). See our Top Picks. Saw palmetto (Serenoa repens) is a type of palm tree, also known as the dwarf palm, which mainly grows in the United States. Its primary medicinal value lies in the oily compounds found in its berries. Most dietary supplements are composed of an extract from the berries or a berry powder. Beta-sitosterol is a type of phytosterol (plant-derived cholesterol-like compounds). Sources of beta-sitosterol include rice bran, wheat germ, corn oils, soybeans, avocados, pecans, and peanuts as well as saw palmetto, pumpkin seed, pygeum bark, and stinging nettle root. Extracts of African wild potato (also known as South African star grass) have been used to produce some clinically studied products consisting of a mixture of phytosterols in which beta-sitosterol is the main component. Men with enlarged prostates (medically known as benign prostatic hyperplasia, or BPH) often experience difficulty with urinary flow, increased frequency and urgency of urination, and a fullness of the bladder after urination. Saw palmetto is believed to inhibit the actions of testosterone on the prostate that cause prostate enlargement and interference with urinary flow. It shrinks the inner epithelium of the prostate, but not the prostate's overall size. It has been believed that saw palmetto dietary supplements provide mild to moderate improvement in symptoms of prostate enlargement. However, the evidence of saw palmetto's benefit is conflicting and recent studies have failed to show any benefit over placebo. A large and well designed study published in 2011 showed no greater improvement with saw palmetto extract than placebo (Barry, JAMA 2011). As an extra measure, that study used the standard dose of saw palmetto (320 mg per day of extract standardized to 85% to 95% fatty acids) as well as twice and three times the dose, each for 24 weeks. None showed a significant benefit. A large study published in 2006 also did not show a benefit with a different saw palmetto extract in men with moderate to severe symptoms. Only more limited studies have shown benefit in men with mild symptoms, or that saw palmetto may be as effective as the prescription drug finasteride (Proscar), but with fewer side effects. Alpha-blockers, meanwhile, may be more effective than saw palmetto. Adding saw palmetto extract (320 mg daily of a liposterolic extract) to treatment with the alpha-blocker silodosin (Rapaflo) (8 mg daily), resulted in greater improvement in symptoms, with no increase in adverse effects, than with silodosin alone in a study in Italy lasting approximately 14 months. Young patients with severe symptoms appeared to benefit most (Boeri, Sci Reports 2018). In contrast, a study in Turkey using tamsulosin (Flomax) (0.4 mg daily) found no additional benefit from adding saw palmetto extract (320 mg daily) (Hizli, Int Urol Nephrol 2007). A trial of saw palmetto (160 mg daily) for 5 weeks prior to transurethral prostatectomy (TURP) failed to decrease the density of prostatic tissue or lower the risk of bleeding during the procedure (Tuncel, Scan J Urol Nephrol 2009). A preliminary study suggested that a saw palmetto extract with added beta-sitosterol (200 mg of saw palmetto standardized to 85% to 95% fatty acids and 50 mg of beta-sitosterol, given twice daily) may be effective against androgenic alopecia (male-pattern baldness). Over the course of the study, which averaged 4.6 months, improvement was seen in 6 of 10 men receiving the supplement, while only 1 of 9 men who received placebo experienced improvement (Prager, J Alt Comp Med 2002). However, the results were not considered to be statistically significant due to the small size of the study. The researchers noted that larger-scale studies would be designed, but none have been published to date. In a 2-year study of healthy men ages 20 to 40 with mild to moderate androgenic alopecia, 38% of those who took saw palmetto extract (320 mg daily -- percentage of fatty acids not provided) had an increase in hair growth, compared to 68% of those who took finasteride (1 mg daily) (Rossi, Int J Immunopathol Pharmacol 2012). However, the study did not compare these treatments to placebo. Interestingly, saw palmetto extract appeared to increase hair growth only on the balding area on the top of the head (vertex), while finasteride increased hair growth on the top of the head and the front hairline. Although not supported by clinical evidence, saw palmetto has also been used to treat bladder inflammation (cystitis), chronic bronchitis, laryngitis, and asthma-associated nasal inflammation, among other conditions. Among the main constituents of saw palmetto berry extract are fatty acids and sterols. The sterols (which include beta-sitosterol) are also present in other herbs (such as pygeum bark, stinging nettle root, and pumpkin seed extract) that are used in treating symptoms of prostate enlargement. Depending on the form of saw palmetto used, e.g., extract or whole dried berry, certain percentages of its weight should be expected (or "standardized") to specific fatty acids and specific sterols. These amounts are based on the composition of saw palmetto products that were shown to work in some clinical trials. (See How Products Were Evaluated for the expected amounts of fatty acids and sterols and see ConsumerTips™ for more information on dosing and usage). Most studies of beta-sitosterol, although not all, have found significant improvement in perceived symptoms of BPH and in urine flow rate. In addition, benefits seem to persist for months after treatment according to a follow up study that looked at men one year after treatment (Berges, Br J Urol 2000). Like the BPH drug finasteride (Proscar), beta-sitosterol may inhibit 5-alpha-reductase activity in the prostate. (See ConsumerTips™ for more information on dosing and usage of beta-sitosterol). At a much higher dosage and in combination with other sterols, beta-sitosterol can also lower total cholesterol and LDL cholesterol levels when these supplements are consumed with meals (see ConsumerLab.com's Review of Cholesterol Lowering Supplements). In this case, beta-sitosterol works in the gut, where it reduces cholesterol absorption. Preliminary evidence suggests that beta-sitosterol may also help strengthen immunity (and prevent the temporary immune weakness after exercise). Like other supplements, neither the FDA nor any other federal or state agency routinely tests the quality of saw palmetto or beta-sitosterol in the marketplace. Previous tests by ConsumerLab.com have found some products to contain less saw palmetto than promised or to recommend a dose below that which has been shown to work in clinical studies. As part of its mission to independently evaluate health, wellness and nutrition products, ConsumerLab.com purchased dietary supplements sold in the U.S containing saw palmetto and/or beta-sitosterol and tested them to determine whether they possessed the amounts of the key plant compounds suggested by their labels. Products were also tested for potential contamination with lead, cadmium and arsenic. Tablets and caplets were also tested for their ability to properly break apart (disintegrate). See How Products Were Evaluated for more information. Prostate Supplements Review (Saw Palmetto and Beta-Sitosterol) !